Anything that makes your life easy is of immense value to you, right? Google Tag Manager (GTM) is one such high-value tool that makes things easier for businesses and data-driven marketing managers. It enables you to perform effective tracking, analytics, debugging of websites and more by dynamically inserting tags (i.e., snippets of code) into the site. But, if you have just started using GTM or do not belong to the developer community, understanding could be challenging. The available Google documentation on GTM is pretty limited and does not always help you understand complex topics related to GTM. And, ultimately, GTM is made available to you to help you save time in setting up Google Analytics and provide more accurate reports. So, if you spend a lot of time implementing GTM or do not do it accurately, it may not serve its purpose. With regard to general GTM resources or in-depth GTM concepts and installation guides, there is numerous content on the Internet. However, the content is limitless and you are bound to get overwhelmed by it, sometimes causing you to not know if the item you are relying on is the best one for that particular GTM topic. So, to make matters easier for you, we list some of the best GTM resources in this article. 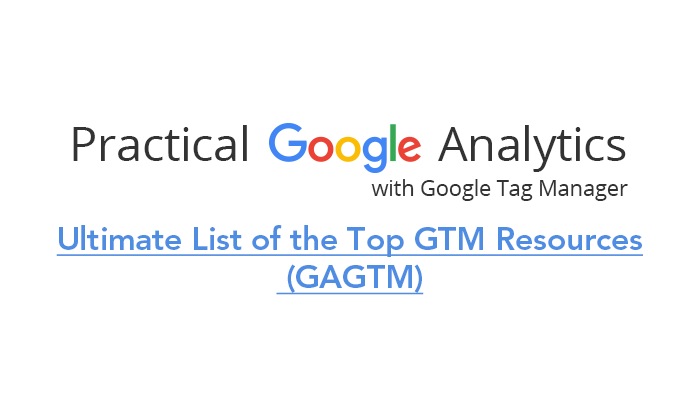 These GTM resources can help you get complete clarity about the use of GTM, its installation, benefits, and more so you can become an expert on this subject. As you go through this list one by one, bookmark the resources that you find most interesting and easy to understand for later reference. As a website owner or digital marketer, if you are still confused about whether or not you should be using GTM, then you would do well to glance through the sites below that clearly explain what GTM is and how it will prove useful to you! It makes sense to start this list with the Google documentation on GTM. Take a look at this site with an overview of GTM, frequently asked questions, pointers to remember before you begin with GTM, and more. This video will give you an idea of the tag management systems and how the one from Google fits into the greater scheme of things for your company or business. Before you jump into using GTM, this SlideShare presentation makes sure that you understand that GTM is not a miracle waiting to happen. If, after visiting the sites above, you are still unsure whether you should be using GTM for your website, then this resource will clear the air for you by providing more than enough reasons to start using this tag management system. Get an overview of the five major fundamental elements (i.e., accounts, containers, tags, triggers, and variables) which make up GTM. Where can I find GTM code? Why should I place the GTM code in <head>? What is the recommended way to install GTM code? This article lists some good alternatives for naming your GTM tags, triggers, variables, and so on. So, you can familiarize yourself with some GTM naming strategies. Here you will learn how you can effectively test the tag manager, after it is installed, to ensure that it works properly. In simple terms, you will know how to troubleshoot or debug GTM. This is a short guide on implementing GTM for mobile app tracking. This standard Google documentation helps you learn more about using triggers, variables, data layers, and so on to set up the firing of tags on your website or mobile app. As part of the GTM process, you need to fire tags and this Google tutorial guides you through various supported tags and custom tags as well as how to use the same in various scenarios. This article introduces you to the concept of variables and different types of variables as well as how to use them for effective GTM implementation. Here you will get an understanding of the importance of triggers as part of the tag creation workflow. This article talks you through the custom variables necessary for your GTM containers. This resource simplifies the manner in which data layers can be used and accessed by you, even if you do not know how to code. Also, get insights into how information gets into data layers and how the tags use this information. This article will help you understand how GTM works best with a data layer and how to leverage the full potential of data layers for your GTM implementation. One of the major reasons for using GTM is its ability to work cohesively with Google Analytics to track various kinds of visitor information for your website and mobile app. Below are some important sites that talk about the different tracking methods and strategies for the GTM-Google Analytics combo. This article will help you understand the different GTM events and Google Analytics events. This article gives a long list of readily downloadable containers that you can import into GTM to enhance your analytics prowess. This presentation discusses the use of GTM for universal analytics implementation. You can ask your technical team to refer to this resource to ensure the safe migration of Google Analytics code to GTM. This resource makes it easy to execute cross domain tracking (i.e., multiple domains) from your GTM account. After reading this article, you will be able to track social interactions in Google Analytics by using GTM. Learn the steps needed to implement dynamic remarketing through GTM by referring to this Google resource. This article teaches you about setting up Google Adwords conversion tracking. Check which tags are installed on your site’s pages by using this online resource. You can introduce this Web Analytics Solution Profiler to your technical team for debugging tags. Ensure your marketing team has installed the correct Google tags on your web pages with this Chrome extension. Serves as a Google Chrome assistant for your technical team to debug your page template and verify its compatibility with GTM’s auto-event listeners. Like learning how to use any other new tool, the GTM learning process will be a continuous one. Be consistent at it by referring to the plethora of resources mentioned above and even by joining the relevant GTM communities as well as following the top GTM experts. Does the above list of resources look useful? Have you tried any of them before? Feel free to share your feedback or queries in the comments section below.